Although the superstitious belief in vampires had been common in Eastern Europe for centuries, the modern shape of the vampire legend was essentially formed wi th the publication of Bram Stoker’s novel, Dracula in 1897. The general popularity of the Dracula story was significantly expanded with F. W. Murnau’s landmark German Expressionist film, Noferatu, eine Symphonie des Grauens (1922), which was an adaptation of Stoker’s novel. Carl Dreyer's intriguing treatment of the vampire theme in his Vampyr (1932) avoided Stoker's story for copyright reasons. But Werner Herzog directed an explicit remake of Murnau's film, Nosferatu: Phantom der Nacht (Nosferatu the Vampyre, 1979). It is my claim that Murnau's film is a considerable improvement over Stoker's novel and that Herzog's film is an equally significant improvement over Murnau's classic. It is unfortunately ironic to note that in connection with Murnau's film, which concerns a long-held superstition, we have another widespread superstitious belief that haunts us today: the belief that intellectual ideas and expressions should be considered to be someone’s personal “property”. This overextension of a casual metaphor that an idea is like a physical object continues to cause harm when it is applied to legal interpretations. Since the 19th century most countries have enacted increasingly restrictive laws to enforce this misapprehension of what an idea is, and these laws have had the overall affect of diminishing free trade, increasing the polarity of wealth, and reducing your own freedom to express yourself. But most people seem to accept and live with this status quo, perhaps hoping that they, themselves, may someday benefit from this inequitable scheme. I bring the subject up here, because the issue of who owns the vampire legend had a significant impact on film history. Without the rights to Stoker’s novel, Murnau and his producer, Albin Grau, made significant changes to their film scenario, much to the betterment of the film, in order to distinguish their production from the novel. Unfortunately for Gau, although these changes were major enhancements to the narrative, they failed to save his film production company from being sued for copyright violation and driven out of business. 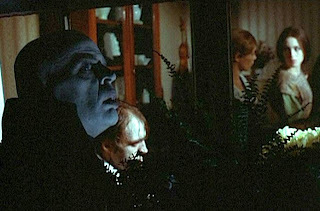 Since Werner Herzog’s Nosferatu: Phantom der Nacht (1979) is a very faithful remake of Murnau’s classic, let’s consider the innovative changes in the story that Murnau introduced for his 192 2 film. Of course the overall outlines of both Stoker's novel and Murnau's film script are similar. Both the novel and Murnau's film concern a young solicitor who is sent off to far off Transylvania to settle a property purchasing arrangement for Count Dracula. Soon after arrival, the solicitor discovers himself imprisoned in the castle and comes to believe that Dracula is a vampire who is headed back to his own city to wreak destruction. Eventually the solicitor makes it back to his home city about the time that Dracula arrives, and a struggle ensues, not without casualties, between Dracula and the people attempting to thwart his evil plans. 1. The destruction wrought by the vampire is primarily the spread of plague. This is a more fundamentally disturbing and all-too-real threat, against which one feels powerless. A vampire is relatively tame, by comparison. The rapid and widespread mass extinction that plague and epidemics can bring about was something with which Europeans had excessive familiarity, and the horrors of World War I and the influenza epidemic were in recent memory. 2. While Dracula was depicted as a suave, smooth charmer who could seduce women with his aristocratic manners, Orlok was shown as a repulsive figure that had the appearance of a grotesque animated cadaver. There was an advantage to this. 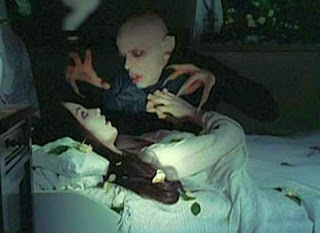 Orlok, whose rat-like appearance invokes images of the plague, was more associated with the “undead” than was Stoker’s Dracula. And the fear of the dead coming back to haunt the living seems to be a primitive fear that stretches across all cultures and time periods. 4. The two major women figures in Dracula, Lucy and Mina, were essentially collapsed into a single character, Ellen, in Nosferatu. This had the advantage of elevating Ellen to having greater narrative “weight” in the story. 5. The characters of Renfield and the solicitor’s employer in Dracula, are coalesced into a single character, Knock, in Nosferatu. I don’t see much advantage to this, but it does reduce the extraneous aspect to Renfield’s presence in the story. The events involving Dracula back in Wismar. Murnau’s Act 4, the longest and most important one, is completely different from Stoker’s, and this creates a fundamentally altered vision for the story. Stoker’s Act 4 concerns a pitched battle between Dracula and the forces of Professor Van Helsing. This is a struggle between two nearly-equal adversaries, with Dracula representing the forces of darkness and Van Helsing representing the forces of scientifically-enlightened human reason and technology. Murnau’s Act 4, which covers the spread of plague in (Wisborg) Wismar, invokes the utter dread of some unspeakable, unknowable force bent on total annihilation. Professor Bulwer and scientific technology are inconsequential here. Murnau’s Act 4 is a more disturbing, more primitive, and in my view, far more effective evocation of sheer horror. And the message is different, too: Dracula is defeated by science, while Orlok is defeated by the power of love. Pursuing further the thematic contrasts between Dracula and Nosferatu in point 6, above, it might be well to reflect on the sometimes perceived difference between two contrasting attitudes concerning horror and science fiction, the “American” and the “British/European”. The American attitude favours freaks and monsters, along with plenty of blood and cheap shock effects to scare the audience. The British/European attitude is said to favour creating a growing sense of dread, the details of which lie uncannily beyond full visual specification. A perfect example of this distinction can be seen in two thematically connected films, Ridley Scott’s Alien (1979, British/European) and it sequel, James Cameron’s Aliens (1986,American). In Alien, the creature that has invaded the spaceship is never fully seen and is constantly changing shape. In Aliens, the threatening creatures are good old-fashioned grimacing monsters with claws and fangs. I found Alien to be infinitely superior to Aliens, because Scott’s film leveraged my own imagination to create the horror. So it should be clear that I prefer the British/European attitude to horror and science fiction, while others (those with more limited imaginations, I assume) prefer the American attitude. In any case we can say here that Nosferatu embodies the British/European attitude, while Dracula embodies the American attitude. So with every change, Murnau improved on Stoker’s story. What about Herzog’s treatment? He followed Murnau’s scenario and approach faithfully, but he introduced further changes of his own. Herzog’s additions and renderings were in fact just as profound as Murnau’s, and the incremental improvement was just as great. It should be mentioned here that Herzog has been the rightful heir to the German Expressionist tradition, and self-consciously so. He famously made a symbolic journey on foot in 1974 from Munich to Paris to visit ailing film scholar Lotte Eisner, whose The Haunted Screen, is the definitive treatment of the German Expressionist film movement. This journey was memorialized in Herzog’s account, Of Walking in Ice. Certainly his approach to the making of Nosferatu displayed reverence to Murnau’s production. But the touches that he added were terrific enhancements. The opening credits are presented over a solemn tour through the mummified tombs of Guanajuato, Mexico, which preserve the horrors of a cholera epidemic in 1833. Several of these shrunken corpses are still clothed, which conjures up images right at the beginningn of this film of a long past holocaust. With Stoker’s copyright expired, Herzog restored the names of the principal characters to those of the original novel. However, he retains Murnau’s character coalescences, so Murnau’s “Ellen” is now “Lucy” (not “Mina”, as you might have expected from Stoker’s novel), and “Knock” is now “Renfield”. The home city of “Wisborg” has not been changed back to Stoker’s London, though, and is now named “Wismar” (which was the assumed real city to which “Wisborg” referred in Murnau’s film). But Wismar isn’t used for the exterior shooting scenes. Instead, Herzog chose to use Delft, with its burgher-style architecture and canals, which conveyed a suitable sense of orderliness that contrasts well with Transylvanian wilderness. The acting in Herzog’s version is, in general, far superior to that of Murnau’s film, even allowing latitude for silent-screen acting conventions. Much of the acting in Herzog’s film is conveyed by physical gesture, anyway, so the actors are effectively performing under the conditions of silent films. 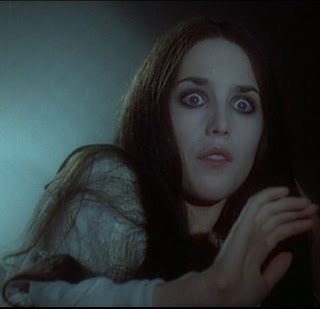 Isabelle Adjani, one of the greatest actresses, gives a memorably haunting performance as Lucy, the ethereal agent of faith and love that faces up to Dracula’s hopeless “nothingness”. Much of her expression is conveyed through her eyes and her looks of alarm, despair, and hope. Although Max Schrek was excellent as Count Orlok in Murnau’s film, Klaus Kinski gives a wonderfully controlled performance here as the fatalistic antagonist in Herzog’s film. Roland Topor, a noted novelist, artist and filmmaker in his own right, is superior as Renfield in Herzog's film to the irritatingly over-the-top role of Knock in Murnau’s version. 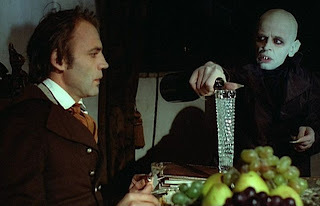 And Bruno Ganz is just right in the role of Jonathon Harker and more believable than the gawky Gustav von Wangenheim, as Hütter. Herzog’s presentation of Act 1, the trip to Transylvania, is much more atmospheric than Murnau’s rendition. His lengthy presentation of beautiful, but brutal, natural mountainous scenes, with craggy rocks and rapid streams, convey both the physical and emotional remoteness of Transylvania much more effectively than Murnau does. He has also added a wonderfully atmospheric scene in which r eal Gypsies tell Harker scary tales about the dangers and risks of his upcoming journey to Dracula’s castle. 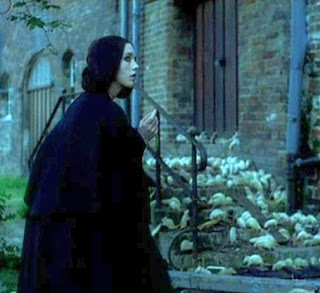 The crucial Act 4, which conveys the existential sense of doom in Nosferatu, was about 24 minutes in Murnau’s version, but has been enhanced and expanded to 44 minutes in Herzog’s version. With many additional touches, Herzog creates a vision of a city fallen to a calamitous and hopeless dystopia. Van Helsing, the original voice of faith in human reason, is here reduced to pitiful fragility and impotence, utterly unable to deal with the out-of-control Renfield. There is an added scene in which Dracula visits Lucy in her room and asks for her love. Lucy expresses firm confidence that, despite Dracula’s supernatural powers, the sheer power of her love for Jonathon, whom she loves greater than God, will restore him to her. It is only faith in love that makes us human. There are additional virtues in Herzog’s film. For example, there is excellent long tracking, hand-held, wide-angle camera work when Harker explores the spooky confines of Dracula’s castle. When Dracula visits Lucy’s bedroom, she sees only his shadow in the mirror and not his reflection, a retention of vampiric lore to which Murnau was sometimes inattentive. In addition, the use of thousands of rats to portray the relentless, invasive spread of pestilence gives a graphical image to our visceral fears of cancer and pandemics. Overall, Herzog completes the transformation of the Dracula story that Murnau initiated. It is now an existential horror story that captures our society's apocalyptic intimations of doom. In the end with Lucy and much of Wismar annihilated, Harker has become a vampire, himself, and sets out on horseback to wreak further death and the imposition of nothingness on a helpless and unsuspecting world. This is Herzog’s characteristicly pessimistic vision, masterfully brought to perhaps his ultimate expression. It also stands at the top of the scale in the history of horror films. "...while others (those with more limited imaginations, I assume) prefer the American attitude." Nothing like a spoonful of snobbery to help one's criticism go down. I've never understood how anyone can mistake "Aliens" for anything other than the action movie it is. Moreover, it's as great an action film as "Alien" is a horror film. I agree, Werner's vision and execution is excellent. While I love Stoker's vision and Bella Lugosi, I love Herzog and zKlaus Kinkski even more...but, we are talking 2 different angles altogether.